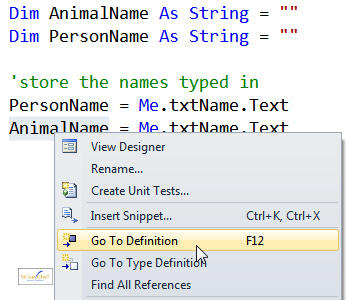 Right-click on any keyword in code view and choose to go to the definition of it by pressing F12. In this case, Visual Studio highlights the definition of the variable. Select the Environment tab, then the Keyboard category. Type in some search string (the word backward works well). Select the View.NavigateBackward built-in command. 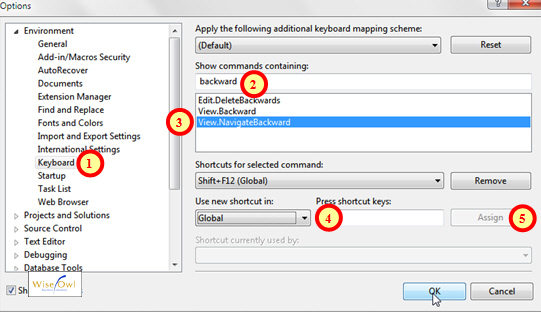 Click in the short-cut keys box, and type SHIFT + F12 (or any other key combination). Click on the Assign button. The nice thing about this key combination is it has a long memory: you can keep pressing SHIFT + F12 to wind back time to your previous cursor positions.